Black Hairstyles Archives - Black Hair OMG! You get to taking the braids out and you have a matted mess! All your BRAND NEW luscious is super-tangled. You're gonna love this one hun! Step-by-Step Blueprint to Detangling Matted Natural Hair After Braids! This is amazing, this sister has so few followers that she hides her subscriber count, but this ONE video has more than ONE MILLION VIEWS! It's THAT GOOD! Because in 4 her step-by-step instructions, this beautiful queen named "Sehvynn" shares how to detangle matted hair after wearing braids, without causing damage or breakage to your natural hair. Best thing is, this method is inexpensive and works like a charm. It is key for helping you to actually retain your new hair growth from the protective style you've been using to protect the luscious! Nice Cheap Trick for Steaming Natural Hair Too! 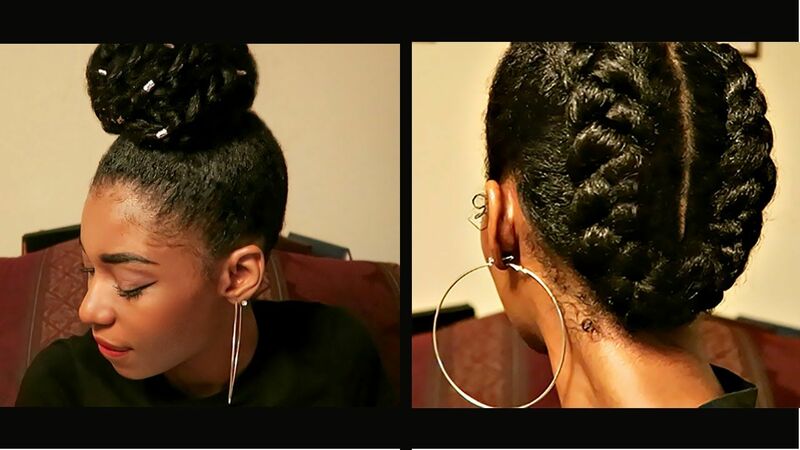 Natural Sistas LOVED This Braid & Black Hair Detangling Video! "R.I.P to all the hair I lost before learning this method..."
"Someone finally told the truth about detangling..."
"This is the best detangling video I've ever seen!" HOW TO: FLAT IRON NATURAL HAIR! Me personally, I can't understand why people get real-world angry about someone applying a little heat to their hair every blue moon. Yes, constant and harsh heat is a known hair killer, folks gets so EXTRA though! Soooo.... I'm guessing you disapprove??? I mean, I don't use heat. But do you boo... And if I do have any reaction it maybe some CONSTRUCTIVE advice or if somebody is totally jackin' their hair up and don't wanna listen, I just sit back, grab some popcorn and get my giggle on. Life's too short too catch a nervous breakdown over somebody else's head of hair. So let me tell you what happened girrrrrl, we've all seen the naturals that get waaaaay in their feelings about what someone else does with their own hair (you know the type), lol. Well honeeeeeey, some of these folks I saw talkin' bukoo crap about this sista named Zoia was just a lil' too much. "Guys, lol. This is crazy I have to post this but I rarely straighten my WHOLE head because I wear sew-ins and do other things to my hair. I give my hair breaks all the time and prior to me straightening my hair this time I went 3 months without putting any heat on my hair! I'm fine with my hair. It's still healthy with my little heat damage in the front! Thanks for the advice though... (smiley face)"
She kept it peaceful and classy, as a true Queen does... And besides that, the proof was ALL THE WAY in the pudding. So not everyone was a negative Nancy, many naturals showed love and tried to let this sista be great the best way she knows how to be. And hey, you'll see for your-dang-self... The style came out GORGEOUS and it's not everyday that you see such quality results when straightening natural hair. "This is straight hair goals. I don't throw heat into my hair too often, but when I do..it won't do right for anything, lol. maybe 10 minutes of being straight before reverting"
Video Tutorial: Straightening Natural Hair With a Flat Iron LIKE A BOSS! OH BABY!!! I gotta something for you to see, your gonna wanna kiss me, you hear me?!? Look sis, let's keep it trill... (yes trill, lol). We're all in the struggle. "Am I the only one who is confused round these parts??? Well, maybe so..."
"Girrrl, I've Been Twisting My Hair Wrong The Whole Time!" The most BOMB part you'll see in this tutorial is that she shows you how most of us are twisting incorrectly and end up lookin' dusted and busted, lol. Yes, she actually shows how to twist WRONG too, the exact mistakes we usually make that are the main reason you don't get defined long-lasting twists. You enjoy this tutorial? Check out this quick article about The BEST Curl-Defining Products For YOUR Hair Texture!